& Occasionally, when you glimpse the spectator's selected card at the beginning of the routine, you'll find that it's one of your setup cards. This poses no problem. Toss the selected card on the table with the others just as you normally would. When you arrange your stack cards, make a mental note of where the selected card should go (i.e., how many cards down from the top of the setup). At the end of phase one, take the deck in dealing grip. Pick up the selected card as you thumb count the proper number at the outer left corner of the deck. Insert the card into the resulting break to complete your setup. & One of the biggest flaws of the any-poker-hand-called^ for plot has always been the problem of low hands. 0 the spectator requests a strong hand, you have a strong climax. If he requests a weak hand, you have a weak climax. I feel that one of my most important contributions to this plot is how to make the weak hands play strongly. It's all a matter of how you handle the revelation. The concept is equally applicable whether you're turning over the top cards of the five packets in phase two or the five cards you've dealt yourself in phase three. (In the latter case, you should deal the five cards in a facedown row in front of you.) A couple of examples should suffice. Suppose the spectator requested three of a kind. This unspectacular hand would seem unimpressive if you just turned up the cards one after the other. Instead, do this. Turn over the first ace, the second ace, and the third ace. Then point to the card that you know to be the king. Point out that, if this card should prove to be the fourth ace, you'll have produced a great poker hand. But you will have failed in your goal because the spectator didn't ask for four of a kind. He asked for three of a kind. Turn to a spectator and ask, "What is the highest card this can he without giving us four of a kind?" When he answers a king, turn the card over to show that it is indeed a king. Now point to the remaining card. Say, T"/ this card is an ace, 111 have a great hand, four of a hind. But J will haue /ailed in my goal Because you didn't ash for four of a hind. If the card is a king, PU stiU have a great hand, a full house. But you didn't ash for a full house, What is the highest card this can possibly he without improving the hand beyond three of a hind?" When the spectator answers a queen, turn over the card to reveal that it is a queen. 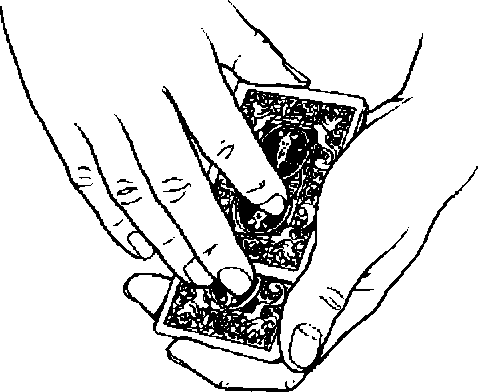 In this manner, an unspectacular hand provides a spectacular demonstration of card control as the audience realizes that you walked a razor-thin line. You produced the strongest possible three of a kind while just managing to avoid anything higher. 1( the spectator requests two pair, ask what is the highest possible pair one can receive in poker. When you're told that it's a pair of aces, snap over the two aces. Ask what is the second highest pair one can receive. When you're told that it's a pair of kings, snap over the two king6. Finally, build up to the revelation of the queen exactly as in the previous example. If you go through all the other hands that might be requested, you'll see how you can apply the same psychology in each case. Ironically, the weakest card in the hand will often provide the most dramatic moment in the revelation. For example, suppose the spectator requests a straight. When you turn over the queen of hearts at the end, the lact that it's not a spade like the other four cards seems a major achievement on your part. Of course, you'll only be able to apply this presentational ploy if you know the setup so well that you know what and where each card is before you turn it over. You should also rehearse how you'll handle the revelation of each of the nine hands the spectator might request. I suggested earlier that you tell the audience that you'll produce the strongest hand you possibly can of the type they request. This is a deliberately equivocal statement. In most cases, you'll produce the highest possible hand of the desired rank. In those cases, after you reveal the hand, you can point out that it is, indeed, the highest hand possible of that rank. The only exceptions are the straight and the flush. In these cases, if someone should point out that it's not the highest possible hand of that rank, you can respond, Tsaid I'd produce the highest hand Ifujssibty could ITiis is the highest hand J could locate " The fact is that no one will bring the matter up; they'll be too astounded to give it any thought. $ Purists among you may realize that a royal flush is not really a separate rank of poker hand. The highest rank is a straight flush; a royal flush is simply a type of straight flush. Similarly, the lowest ranking hand is not a pair but a no-pair hand. Believe me, your audience will neither know nor care.